The Harry Potter Studio Tour London is a must for Harry Potter fans. Sure, you can go to the different filming locations throughout the UK like in Oxford, London, and Scotland. But if you want to see the set items from the film, this is the perfect place to go. The first thing you need to do is to book way in advance. You should book your studio tour tickets ahead–as in way, way ahead. 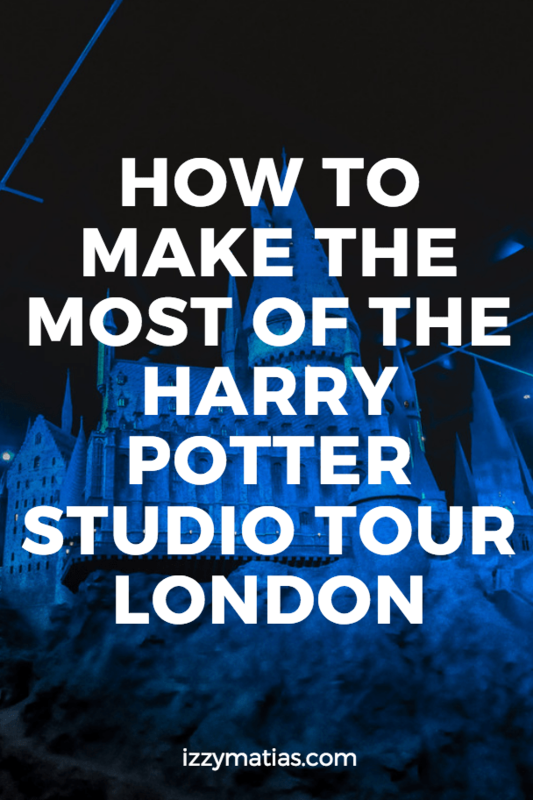 The minute you book your trip to London, book your studio tour tickets online because they sell out fast. As far as I know, tickets can only be purchased online. Deluxe tour – this option includes a guided tour and free butterbeer; it’s a hefty list you can check out here. Fret not dear muggle, for though you cannot fly a broom or use the floo network, there are other ways to get there. You can opt to go by bus or by taking the underground. I suggest taking the latter for a faster option. Be sure to get off at Watford Junction Station. When in doubt, ask for directions to make sure you’re taking the right line to your destination. Since I had to switch trains, it took me 45 minutes to get from Shepherd’s Bush to Watford Junction Station. Once you arrive, you then have to look for the official Warner Brothers Studio Tour shuttle bus. For a minimal fee, this bus takes you straight to the studio tour in about ten minutes. It’s time to experience the Harry Potter world in a whole new way. You need to proceed to the ticketing area where you will exchange your printed online confirmation for an actual ticket. This is where things start to feel real and your excitement levels are rising. If you get the option with the digital guide, you’ll have to claim your audio guide, which will accompany you throughout the tour. If you’ve read Film Wizardry, the audio guide is similar to what’s inside the book but with an added bonus: Tom Felton is your guide. The audio guide tells you more about each station. Before you enter the studio tour proper, my number one tip for you to make the most out of you experience is to eat first in their cafeteria. So say you booked a ticket for the 11 am tour, go an hour early so that you can eat. That way, you don’t have to worry about hunger pains pressuring you to finish the tour earlier than you’d like to. Especially ‘cause the ticket doesn’t allow re-entry, so once you leave you can’t go back in. However, you can buy snacks and butterbeer mid-tour. If you’re famished, a hotdog won’t be enough to sustain you throughout the tour. There is a lot, and I really mean A LOT to feast your eyes on in the tour. I had a 10:30 am ticket, but finished at past three. I don’t recommend you skipping meals, but I didn’t want to rush through a tour I’d spent my savings on. There’s a long queue to enter the tour, but the line moves quickly. As you wait in line, you’ll see Harry’s cupboard under the stairs. You’ll then enter an empty room surrounded with television screens. There’s a short video introduction. Afterwhich, you’ll enter a cinema where another video plays. This time Emma, Rupert and Dan welcome you to the tour. As soon as the screen rolls up, you’ll see the massive doors of The Great Hall. During the first part of the tour, a tour guide will accompany you as you walk through the doors of the Great Hall. Once inside, you can go at your own pace, really taking in everything around you. Behind the Scenes items like costumes, furniture and props. Here’s a trivia about the studio: the studio used to be an aircraft factory for about 55 years before they converted it into a filming studio. The Harry Potter studio tour London has special features every few months. They had a broomstick making booth because that was the feature for that month. The artists who made the brooms for the film were carving brooms on the spot. I really wanted to take one home with me, but I didn’t dare ask if it was for sale. There is so much to see that the tour can be overwhelming, so take your time and go at your own pace. Aside from set memorabilia, the tour also features interactive experiences like riding a broomstick or the Angelina Ford. After this part of the tour, you enter the backlot where You’ll find the Hogwarts Bridge, Knight Bus, Chess Pieces, and Privet Drive! It is also in this area where you can get some cool Butterbeer and munch on a snack as your legs take a break from walking. The next part of the studio tour features the prosthetics, magical creatures and scaled paper models of all the film sets. The attention to detail is truly incredible. You will then wander inside Diagon Alley before the big finale of the tour: the life-sized model of Hogwarts! I couldn’t believe that after years and years of loving this film so much I was finally here. You’ll want to spend as much time as you can in this room really observing the beauty and intricacies of the Hogwarts castle. So glad I found this! My wife is taking a work trip to London in March so my son and I are going to tag along. We were looking for things to do while there! Awesome! That’s great. Enjoy London. Oxford is also another great place to visit in the UK! I really want to do the Harry Potter tour when Im travelling and say I am from the UK I am often asked if I have been here so would be great to say yes. Thanks for the tip about getting the tickets in advance I didnt realise that they sold out. I am SO jealous – I would love to go. It looks like a lot of fun. This looks like such a cool place to visit! It’s on my list for when I next visit the UK! Great post and tips! Thanks for sharing! I’m not even a fan of Harry Potter and your post makes me want to go see it! Great tips and thanks for sharing! This is a great way to save time, thanks for sharing the article. I am a huge Harry Potter fan, so I can’t wait to visit. How great was this! I love all the informative insights! Totally will be using this for our upcoming trip! I loved visiting this set- the amount of detail that went into the making of these movies is insane! All great tips! Right? It really makes you appreciate how creative everyone who worked on the Harry Potter movies are 🙂 Thank you! I hope to go one day! It looks like a magical day!